"Sputnik is a sassy 2½-year-old female Cockalier. She has a sweet and playful disposition, but she really loves sitting on laps and getting her belly rubbed. She is very intelligent and can easily sense moods and emotions. Sputnik is very gentle; however, she enjoys playing with other dogs, regardless of size. She is a wonderful companion and constantly gets attention from everyone who comes into contact with her." The Cockalier is not a purebred dog. 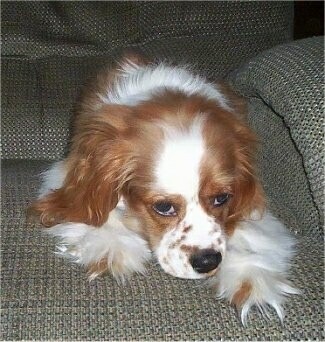 It is a cross between the Cavalier King Charles Spaniel and the Cocker Spaniel. The best way to determine the temperament of a mixed breed is to look up all breeds in the cross and know you can get any combination of any of the characteristics found in either breed. Not all of these designer hybrid dogs being bred are 50% purebred to 50% purebred. It is very common for breeders to breed multi-generation crosses. "Pebbles the Cockalier at 1½ years old (Cavalier King Charles Spaniel / Cocker Spaniel mix breed dog)—her passion is to chase the neighborhood squirrels. She enjoys going to the dog parks and dog lakes. Pebbles loves to give kisses and will sometimes grab her leash and "walk" herself. She truly is great to have around the house." 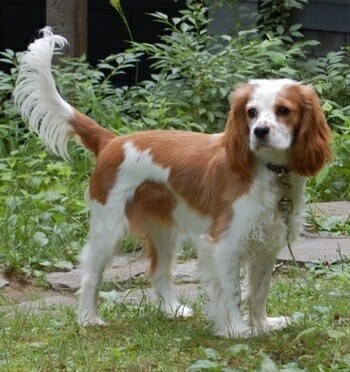 Scarlet the Cockalier (Cavalier / Cocker mix breed dog)—"Scarlet is by far the most affectionate dog I have ever encountered and I would definitely adopt another dog of this hybrid." 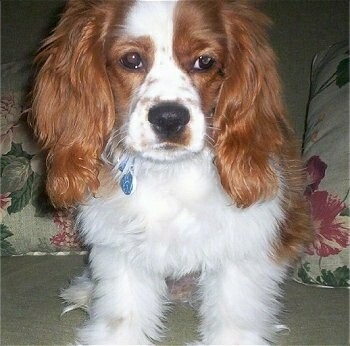 Tanner the 7½-month-old Cockalier—"His mother is a fawn colored Cocker Spaniel and his father is a tri-colored Cavalier King Charles Spaniel. Tanner's parents are on the smaller side, so I don't think he will get real big. He has both Cocker and Cavalier attributes. Although the dog can come out looking more or less like either of the breeds it is being mixed with, Tanner seems to be a happy medium!" Otis the Cockalier at 10 months old—his owner says, "Our dog is pretty big, weighing over 30 pounds at 10 months. He recently got a "sporty Cocker" haircut because the groomer feels his body shape is more Cocker than Cavalier." Buca the Cockalier at 5 years old—"This is our girl Sambuca. Buca for short. She loves to give kisses and cuddle. She loves to look at squirrels all day from the window." Otis the Cockalier has a great disposition, loves to swim and is very playful with children. Regal the Cockalier at 4 months old—"She is healthy, sweet, and easy to train because of her high intelligence and eager submissive compliance. 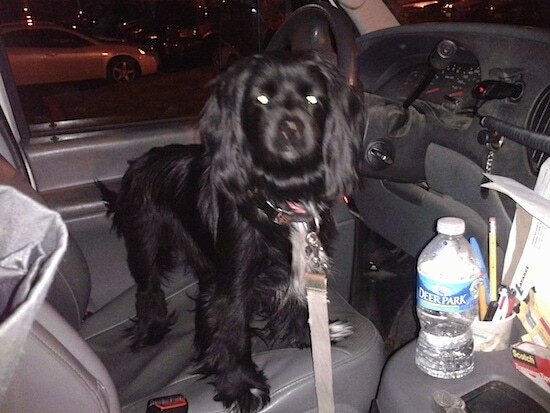 She seems to have the best of both companion spaniel breeds." Regal the Cockalier at 11 months—look how fluffy!